Over the past few weeks, I've been contemplating WHY I wanted to do this blog. 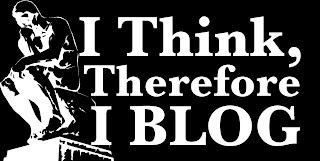 Originally, I wanted to provide insight into blogging, being a blogger, and my life as a horror movie reviewer. My posts were originally supposed to be fairly short, and for the most part humorous. They were supposed to be entertaining and informative. Now, however, the focus is changing- probably because I'm changing... or at least my needs and wants in regards to this blog are changing. Now, I need (and want) this blog to be something more- something deeper... more real. My last two posts have helped to solidify the desire to have this blog be a more personal, realistic expression of the blogger/person that I am. Not only is this blog going to be a place of humor, and information, but it'll be a place where the entire range of my emotions can be found. Sorrow, joy, anger, hopes, dreams, fears, and nightmares will be found within the entries as this blog grows and deepens in content. This blog won't be just about me... it will be a part of me. A part of me that I'll be sharing with all of you. Over the course of the years, you will truly see what goes on inside the mind, heart and soul of this blogger. Join me as I write my thoughts down... and discover the world through my eyes.